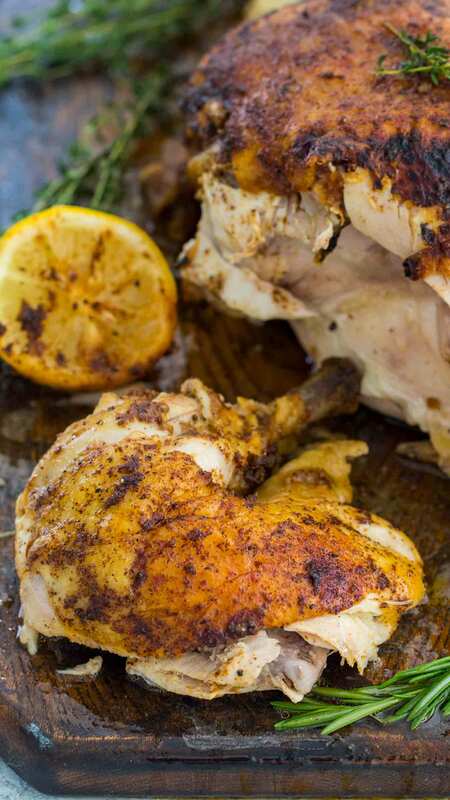 Instant Pot Whole Chicken is juicy, tender and incredibly easy to make. You can make this time-saving recipe with fresh or frozen chicken. 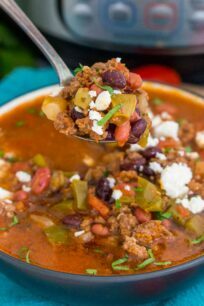 Instant Pot recipes are a staple around here, you just can’t beat the convenience. The Instant Pot Orange Chicken is the most popular recipe on the blog, without a doubt it’s delicious. Being a huge fan of rotisserie chicken, and cooking it so often in the pressure cooker, I have finally perfected the recipe to share it with you. 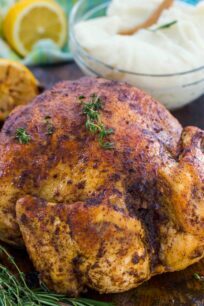 Instant Pot Whole Chicken rotisserie style is very popular in our household. The best thing about this recipe is that in case you forgot to thaw the meat, you don’t have to worry, you can still cook a delicious dinner. That is the beauty of the pressure cooker, you can cook frozen meat like its no big deal. Learn here How To Cook Frozen Chicken Breasts In The Pressure Cooker, Frozen Chicken Wings, and Frozen Ground Beef! 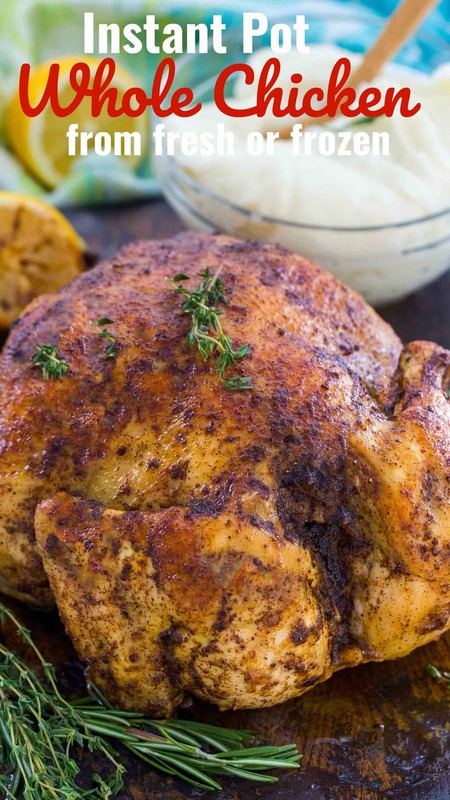 The pressure cooker rotisserie style chicken is to die for! The meat is perfectly cooked, juicy and very tender. To get the skin crispy, just brush the meat with a garlic butter mixture and broil until golden brown. Your family will love this easy, delicious and budget-friendly meal. Why cook a whole chicken in the Instant Pot? Cooking a whole chicken in the pressure cooker is a great idea. First, you can cook it fresh or frozen, which add bonus points to it. The meat ends up being very moist and tender, just like it has been slow roasted for hours. Also, you can’t beat the convenience of being able to cook frozen meat in just under 2 hours, it takes way longer to defrost it. 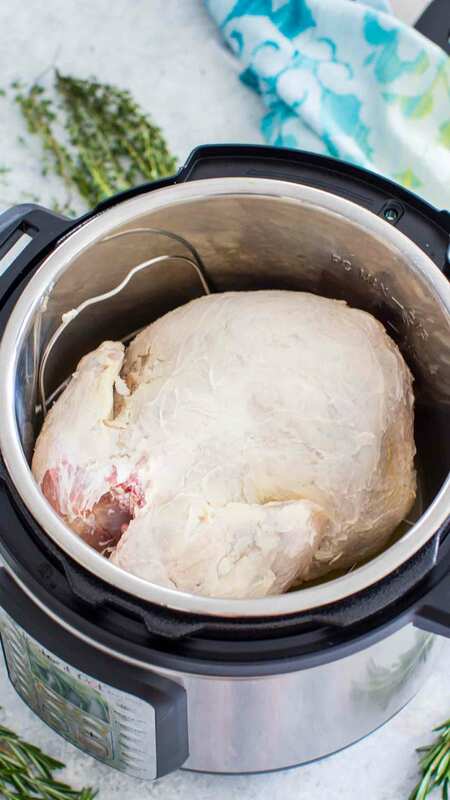 How long do you cook a whole chicken in the Instant Pot? What do you need to make the Instant Pot Whole Chicken recipe? How do you cook a whole chicken in the pressure cooker? 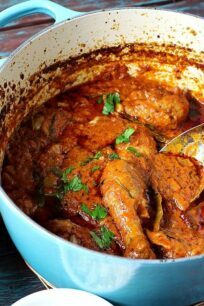 All you have to do is add either fresh or frozen poultry to the pressure cooker, add water and cook on High Pressure per recipe directions. Then, release pressure, remove the bird from the pressure cooker and brush with melted butter mixed with your favorite seasoning. Lastly, broil it, checking often so the meat doesn’t burn. What can you do with leftover chicken? Leftover meat doesn’t have to go to waste, it can be added to many delicious recipes, like this Chicken Spaghetti Casserole or Crack Chicken Casserole. You can also add it to salads, wraps sandwiches. A Natural Pressure Release means that the pressure is released gradually. For a Natural Pressure Release, you click on Keep Warm, and wait 10-15 minutes (or based on what the recipe says), after which you open the valve and let any leftover pressure to release. Another option is to Turn Off/Unplug the pressure cooker, wait 10-15 minutes (or based on what the recipe says) and after that open the valve. A natural release is usually used when cooking soups, meat in a large amount of sauce, pasta or steel cut oats. This method prevents any foam from the dish to shoot out through the valve, which can happen during a Quick Pressure Release. Instant Pot Whole Chicken is juicy, tender and incredibly easy to make. You can make this time saving recipe with fresh or frozen chicken. Press High Pressure and set the timer to 25 minutes. See the blog post for cooking times based on chicken weight and if using fresh or frozen chicken. Open the pressure cooker lid and remove the chicken from the pot and place it on a baking sheet lined with aluminum foil and drizzled with olive oil. And THAT’S why I love my Instant Pot. I can’t wait to make this. My family is going to devour it. 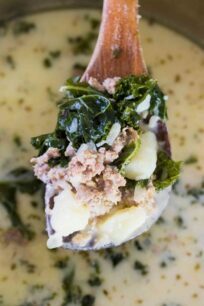 The family loves this meal and it’s so easy to make !! I never make whole chicken, and I don’t have an instant pot, but now I want both of these things. That looks GOOD! This is going to be such a life saver to busy families! So quick and easy! Can’t wait to try this! It looks so perfect! This is perfection!! Great to try this weekend! We love this kind of recipe. Perfect for when there is a special dinner or a get together. Easy to make and it looks so delicious! I haven’t tried a whole chicken in the IP, but this makes it sound so easy! I am going to have to give this a try very soon! Great use of instant pot love how this came out! I’m still not seeing a video. Please check the video just above the recipe card. It is there, thanks! I made this tonight and it was so tasty and tender. We loved it. This is a must try recipe. Wow what a good idea to make the perfect chicken!!! Made this for dinner tonight and LOVED it. It was so easy and the chicken turned out very moist and tender. I did not have lemons so I used oranges instead. Thank you! Hi Maggie, thank you for the feedback, so happy that you loved it! I used a 5 Lbs chicken. I was very impressed with this recipe. Everything turned out perfect but the really surprising thing was I had six meals off the bird and each meal was as tender and juicy as the first meal! Good recipe. The cooking time was not right for me. I used a 4.5 pound chicken (weighed it right before) and cooked at 28 with 15np release. My chicken basically blew open, still edible but not nice looking like the picture. Not sure if others have come across this but definitely cook less than shown just to be safe. You can always add a few extra minutes. Can a larger oven stuffer roaster that weighs 6 lbs be cooked in the instant pot too? What would the new cooking time be? Yes, if it fits you can cook it. Check the post I provide the timing per pound, so it can be derived from that. Looks good…need one clarification, please. The recipe instructs to place chicken breast side down in the pot. However, the video shows breast side up in the pot. Which way should it be? Its actually breast side down in the video, it means the thick part of the breasts if that confused you. Made this for the first time in my IP. Had to approximate the weight of chicken, about 4.5-75 lbs, chose Meat setting (HP) x 30 min. The next day did the broil. The taste was incredible–especially with the topping mix! The texture was slightly dry–will do the IP and broil back to back next time and maybe lower the cooking time to 29 min. Thank you for this delicious recipe! I don’t see where it’s says how many minutes per pound the chicken needs to cook. I have a 6-7 chicken. Help! Hi, I was wondering if I could substitute beer for the chicken stock. I love “beer can chicken” and would like to try and get a similar flavor. Thanks! PS Got a IP for Christmas and every recipe I tried here has been very good! Looking forward to trying many more! Yes!! You can use beer, I would say that use a mix? Half beer and half chicken stock? The beer doesn’t fully evaporate in the IP, like it does in the oven or slow cooker, so to avoid the flavor being overpowering, use half and half I would say. Turned out great! I cut the butter a bit (to my taste) and it was still incredibly moist and flavorful. I had leftovers for a solid week too. You can’t go wrong, virtually no prep time. This chicken recipe is amazing. I did make an easy change to finishing off the bird. I placed the chicken in a baking dish with all the spice goodness. Set it in the oven at 425* for 20 minutes. It gave it time to make a Crispy delicious skin. Can you cook veggies in with the chicken at the same time in the instant pot? no, not enough space after you add a whole chicken and way too much time for the veggies, they will be super mushy. I was amazed how juicy the breaths were. When I tried to move it to the baking sheet, the bird broke into three pieces. Lol. I’m thinking of using the leftover broth for chicken soup. Gonna try that tomorrow but conventionally on the stove. I’ll let you know how it turned out. We are having dinner guests today and my hubby, who planned it, forgot to take the chicken out of the freezer. I thought – no problem! I can cook it frozen in my IP. I went to put the chicken in and noticed it had the bag of giblets in it. I tried everything to get them out, even cooking the chicken in the IP for 15 min. They are frozen in there. Not sure what to do. oh wow this never happened to me, I usually run it under warm water and remove them.